Disclaimer- I know the owner… He was kind enough to bring me a bottle from his estate in Bridgetown, Western Australia. 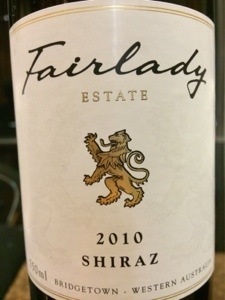 This is an atypical Aussie Shiraz, which is a good thing. I’m not a fan of the bombastic jammy style associated with the region. This wine is more Rhone-like in my opinion. Its started off with black currants and tar on the nose. Plums and vanilla came across as I enjoyed the mouth coating tannins. I wrote ‘juicy wine with good tannin structure that covers the gums’ in my notes. I was also impressed by the long finish and finesse of this wine. The back end had more tar and some herbs that combined to give it a delectable earthiness that I found fascinating. I believe it retails at $15. Hopefully some of my Australian readers can find it in their shops and give it a try. I think it has a 5-7 year drinking window and would love to try it again in a few years. I’m going with 89+ points and 4 stars. Salut….